And pray for those God is calling right now, and will call in the future. 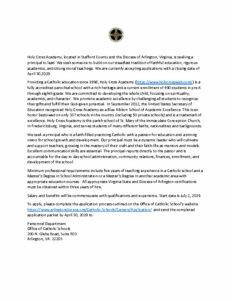 If you or someone you know might be called to explore their vocation to priesthood or religious life, contact Fr. Isenberg, vocations@arlingtondiocese.org or 703-841-2514. God still calls. Even when we see our Church in turmoil, when we witness daily trials to our faith, when we hear of violence to people of faith, often in the name of religion, God is still calling men and women to follow him. These seeming obstacles only make God’s case —and ours — more compelling. Our world needs saints, holy men and women who’ve made an encounter with the love of Christ and offered their very selves to bring this love to others so desperate for it. Let National Vocations Awareness Week be an invitation, a call, to all of us, first to encounter Christ’s love, and then to let it compel us to be — and to pray for — the saints our world needs.